Every kid will love to learn the truck driver lingo in the story, and shout out their own sound effects as they return for another ride, read after read. 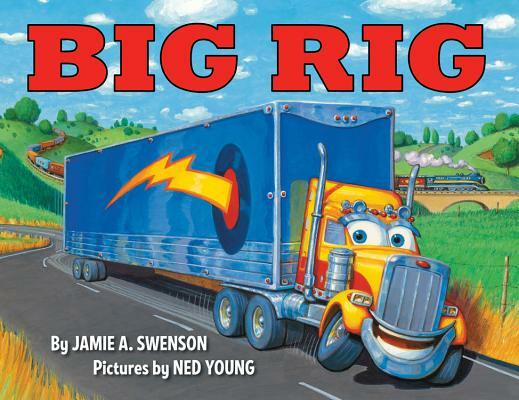 Author Jamie Swenson takes readers from zero to sixty with her fast-talking truck and Ned Young's bright and engaging illustrations. Jamie A. Swenson received her MFA from Hamline University. She works as an early literacy storyteller and librarian at the Hedberg Public Library in Janesville, Wisconsin where she shares fabulous books with children and adults. Jamie lives with her husband, two daughters, two dogs, and one lazy cat. Jamie would love to go on a trip with a big rig like Frankie-URRRRNNNT-URRRRNNNT! Cruise on over to her website www.jamieaswenson.com. Ned Young is a self-taught painter and illustrator whose work has been published on a variety of merchandise, including prints, calendars, puzzles, mugs, and greeting cards. He is the author and illustrator of the Zoomer series. He lives in Brigham City, Utah. Visit him at www.nedyoung.blogspot.com.